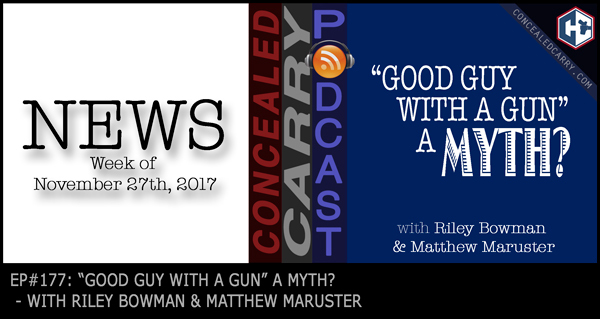 Episode 177b: “Good Guy With a Gun” a Myth? Topic: “Good Guy With a Gun” a Myth? We hope you had a fantastic Thanksgiving. Over the break there were so many new stories that we just had to talk about, we split this episode up into 2 parts. Enjoy this part 2 where we talk about the discrimination Facebook is committing by restricting and shutting down firearm related pages and ads. Also we dive into an article written by an Army veteran and gun owner that tries to reason that the whole “good guy with a gun stops a bad guy with a gun” premise is just a myth. But we follow that right up with at least 2 JUSTIFIED stories from the last week that blow holes right through that ill-informed statement! Hit the ‘PLAY' button and listen in now!! I'm an Army veteran and gun owner. The ‘good guy with a gun' theory is a myth.